The first 30 Soldato Futuro kits have been fully delivered. A further 62 kits that form the second batch are currently under production and will be delivered during 2011, and will be used to reach the production configuration. Italy’s Defence Administration has also signed a contract with the industry team formed by Selex Communications as leading company, Selex Galileo, Larimart, Beretta and Aerosekur for the Concept, Development and Experimentation (CD&E) phase of the Forza NEC programme. Future soldier programmes are complex; not only for technical reasons but also because the time span needed for their development often bring changes due to lessons learned in operational theatres, doctrinal modifications and to technology, either because promising technologies did not develop as hoped or because new emerging technology have come into the equation. Italy’s Soldato Futuro is no exception, and in the recent past, decisions have been taken that ensure that the in-service system look slightly different from the prototypes seen thus far. Currently, the first 30 Soldato Futuro kits have formed the first batch of the 92 kits overall that were part of the contract signed in 2007, have been fully delivered. These cover three configurations; commander, rifleman and grenadier. Those systems are at the Version 1 standard, and capitalise on the operational and technical tests carried out on three prototype systems, as well as on a series of stress-tests conducted during the production phase. The further 62 kits that form the second batch are currently under production and will be delivered during 2011, and will be used to reach the production configuration. Recently Italy’s Defence Administration signed a contract with the industry team formed by Selex Communications as leading company, Selex Galileo, Larimart, Beretta and Aerosekur for the Concept, Development and Experimentation (CD&E) phase of the Forza NEC, the Italian Army’s main battlefield digitization programme. This includes the delivery of Soldato Futuro production systems in the numbers necessary to equip two infantry regiments; both part of the “Pinerolo” Brigade that is becoming the first digitised medium brigade of the Italian land component. According to the contractual scheduling the first systems will be delivered in the first quarter of 2012, the delivery being completed within late 2014. Soldato Futuro is the key node of the Forza NEC architecture and is integrated with the command and control systems that are being installed on combat platforms, such as SICCONA, the first releases of which are already being used in Afghanistan on board the Freccia 8x8 AIFV. The Soldato Futuro system will be deployed with all the digitized units that comprise Forza NEC programmes such as the ISTAR unit, mortar units and the Digitised Landing Force, which constitutes the main thrust of the programme. The CD&E phase is considered a risk-reduction tool that will allow the validation of technical-operational concepts in the field before launching large scale series production. Serial production Soldato Futuro systems will equip various Army and Landing Force units, in order not only to verify and validate the operational efficiency of the system, but also to determine if and how much benefit the system provides in increasing the operational effectiveness of the dismounted soldier. Besides the planned introduction of the Soldato Futuro system, it is clear that some of the sub-systems developed for that programme are being introduced in service early as stand-alone items, to be subsequently merged with the other Soldato Futuro elements when these are delivered, while other components are becoming part of the system although they were developed outside of the programme. This is true largely for sub-systems which don’t integrate with the electronic architecture and items such as the rifle and the body armour. The Beretta ARX 160 assault rifle has been appreciated by those soldiers who used it in Afghanistan. The good work carried out during the evolution phase of the weapon have allowed it to fully satisfy operational and logistic requirements and lessons learned thus far have to date brought only minor modifications to meet the needs of specific units, such as Special Forces. The rifle is being acquired via separate contracts and can thus considered a spin-off of the Soldato Futuro, although it will become an integral part of the programme for those units that will receive the kit. As for the Soldato Futuro’s NC4-09 body armour, this can best be considered a “spin-in” as its development was carried out outside the programme. Deployed in Afghanistan, this state-of-the-art system answered the ballistic protection requirement, adopting the best materiel available on the market, and was appreciated for the ergonomic solutions that have allowed a reduction in weight, while ensuring maximum freedom of movement. The Forza NEC programme, which includes the Soldato Futuro, is based on two fundamental concepts, “evolution through production” and “transforming while operating”. Therefore all the elements, first and foremost the Soldato Futuro, are the subject of a continuous technical and architectural evolution in order to align their performances to the operational units requirements. The process includes a continuous cycle of operational testing, design amendments, technical and operational validations, design reviews and new implementations. To ensure the optimal management of such process, which involves both the technical-administrative and operational branches of the Defence establishment, a Forza NEC Program Direction has been established at the General Secretariat for Defence/National Armaments Direction in order to tune and coordinate the various requirements. In terms of integration, the two most critical components of Soldato Futuro remain the C4I subsystem and the rifle optronics. The former has been driven by operational needs with only minor refinements, mostly aimed at increasing reliability of those hardware and software elements that were highlighted following the systems’ operational and stress trials. The greater part of the current activity is aimed at improving ergonomic factors, reducing weight where possible and redistributing the equipment on the soldier’s torso in order to provide the best possible balance. The series production configuration that will be issued for the CD&E phase will also include a new manportable software defined radio. For the optronic suite, things are quite different. 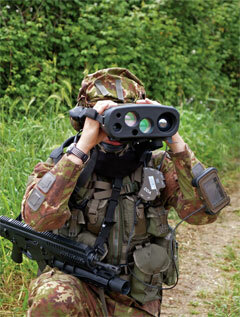 The original requirement of the system, issued in the late 1990s was aimed at integrating in a single subsystem IR, daylight and laser aiming capabilities. Despite over ten years of development, technology has not yet provided the necessary hardware components with the weight and dimensions that do not negatively affect the ergonomic profile and weight of the integrated aiming sight, a problem that became clear during operational testing. According to those results, similar to many of those obtained in similar national programmes. New modular solutions are being studied, with the aim of maintaining both day and night surveillance and engagement capabilities, enhancing the flexibility of use. Technical and operational trials are still ongoing in order to identify the optimal solution in terms of efficiency that will then be adopted for the CD&E phase. Another issue is the basis of which C4I equipment has to be issued. Currently, the Italian Army plans to issue the same C4I components to all the fire team members with some additional solutions going to team leaders. Only the operational use of the system will provide final indications on the need for providing the same capacities to all team members.